Start Your Own Business | Find Your Own Success! Charge Clients Over $135 an Hour! Should you drive a car after only viewing a video? Should you scuba dive after only reading a manual? Should you fly a plane after only attending a lecture? The answer to all of these questions is of course, NO! To learn a skill or trade, hands-on training with oversight and instruction is imperative. At Bio-Trauma 911, Inc. we believe that "practice makes perfect". Our hands-on training module gives us an edge over other companies that fail to provide hands-on practical application of industry standard techniques and principals. 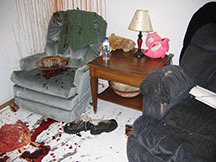 Our Crime Scene Cleanup Training Course will prepare you like no other similar course of instruction. Insurance companies, property managers, medical examiners, home owners and others will expect you to be professional, knowledgeable and proficient. Are you up for the challenge? 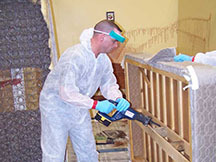 Biohazard Remediation, which is more commonly referred to as Crime Scene Cleanup, involves the identification and removal of blood and bodily fluids following a criminal act, trauma related incident or accident. It is a service that is in great demand with very few qualified companies available to meet that demand. Following a crime, traumatic event or accident, and after the removal of the body or injured person, business management or the home owner must face the daunting challenge of removing the blood and fluids that remain. More often than not, a police officer, firefighter or medical examiner will recommend the property owner to contact a crime scene cleanup company. Most of the services required for proper remediation will be covered under the property insurance policy and requires only the policy deductible be paid by the insured. The day #5 business module of our biohazard remediation course will provide you with information related to income, expenses and estimated profit margin. This training module will also provide you with a wealth of information, handouts, CDs and more to help you to create a professional and profitable business. While we don't publish this information, the profit margin expected through your new biohazard remediation business may be great enough to afford you the financial stability and independence you've been searching for. 1. Read this "Training Overview"
Bio-Trauma 911, Inc. has welcomed students from nearly every part of the continential United States, parts of Canada and from several countries in Europe and South America. Nearly every student who completes our course of instruction goes on to start their own crime scene cleanup company. Other students, who may be enrolled by their employer, return to their company to start and head new divisions involved in the crime and trauma scene cleanup industry. Upon graduation, students receive certification cards with picture ID and certification patches for their shirts or jackets. These will be provided free of charge to each graduate. Students traveling to Indianapolis for our Crime Scene Cleanup Training Course will have the option of staying at Suburban Extended Stay Hotel, located at 8055 Bash Street, Indianapolis, Indiana 46250. The student rate offered by Suburban Extended Stay may fluctuate but ranges from $55 to $75 per night. Various other topics will also be discussed. Please view our Crime Scene Cleanup Training Course Outline for more information. Limited seating is available for each of our crime scene cleanup courses and all available class seats are generally sold within weeks of the class start date. We are currently accepting reservations for all of our upcoming training courses. To view our training dates, please click here Training Dates. To reserve your seat early, please visit our Online Reservation Page. Our class size is limited and seats do not last long. Bio-Trauma 911, Inc. does not offer any type of financial aid and does not act as a job placement agency. Should you have any questions regarding our crime scene cleanup training course or the reservation process, please contact Steve Hanna or Brandon Stone at 1-800-759-6960 or click Contact Us. 1. How many students do you accept for each class? We typically only accept eight students for each class. However we have recently expanded our classroom and training suite to accomodate up to twelve students. 2. How quickly do classes fill up? Our classes typically fill up very quickly. If you are interested in attending one of our classes, please reserve your seat as soon as possible. 3. How do I reserve a class seat? Please click this Reservation Form Link to be redirected to our reservation form (the link will open in a new window so you will not lose your place in our website). Once your reservation form is received, we will make contact with you to let you know if seats are still available. If a class seat is still available, we will require a down payment to hold your seat. You may opt at this time to make either the down payment or to pay in full for your class seat. 4. Is Bio-Trauma 911, Inc. an employment agency? We are not an employment agency and will not find you a job after you complete our course. 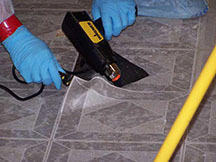 We will however make every effort to refer business to you and/or your new crime scene cleanup company in area that we do not currently service. 5. Where is the training course offered? Our training course is offered in Indianapolis, Indiana. Since a good portion of our training is hands-on in a staged training environment, it is not possible for us to offer this training in other areas. 6. Are meals and lodging included in the course fees? No. Your meals and lodging are an additional expense. Our training staff does provide drinks and snacks during the day. In addition, students receive a discounted rate at a local hotel. To book your hotel reservation, please call Suburban Extended Stay Hotel at (317) 598-1914. Let them know you are a student of Bio-Trauma 911, Inc. and your nightly room rate will be $45 for a studio and $55 for two queen beds. 7. 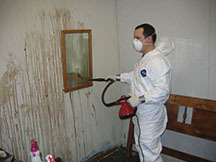 How can I pay for the Crime Scene Cleanup Training Course? Bio-Trauma 911, Inc. accepts checks or credit cards. If paying by check, please submit payment at least two weeks before the start of the course. If paying by credit card, payment may be made by clicking this Online Payment link. 8. What if I reserve a seat and make a down payment but can't attend the course? You will have the option of rescheduling to a different course date or you may receive a refund. We do retain part of the down payment to cover our processing fees, administrative time and loss of income if we are unable to sell your previously reserved class seat. 9. Does Bio-Trauma 911, Inc. accept any form of financial aid? We do not accept financial aid or offer any type of tuition assistance. 10. How long has Bio-Trauma 911, Inc. been training students?